Sorghum is a gluten-free whole grain. It has an extremely high nutritional value, with high levels of unsaturated fats, protein, fibre, and minerals like phosphorus, potassium, calcium, and iron. It also has more antioxidants than blueberries and pomegranates. Sorghum gives a lovely chewy texture and is one of our favourite grains to use at the moment. Because the texture is on the harder side, we don’t tend to use this grain as a base, like you would brown rice or quinoa. 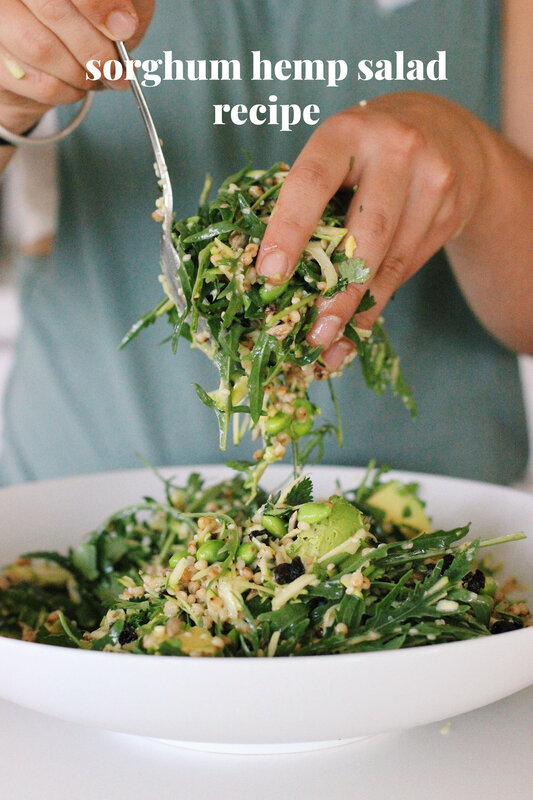 This is why it works so well in this salad because it is like chewy little seeds throughout the salad. Paired perfectly with crunchy edamame beans, raw grated zucchini, fresh bitter rocket and creamy avocado chunks. We know you’re going to love it! If you can’t get your hands on sorghum, any other grain such as brown rice, barley, quinoa etc will work perfectly.This is great served on its own or is delicious with fish or chicken.